This display is neither chronological nor complete, but it assembles about thirty of her works (drawings, photographs, sculptures, performances, projects …) like so many fictional markers, narrative initiations and illusions. The art of Nathalie Talec (born 1960) constitutes a portrait of the artist as explorer, a self-portrait with or without storm microphone, with or without glasses for assessing distances in a cold land. The exploration of the polar regions (discovery, surveying, mapping and survival techniques for extreme conditions) becomes a metaphor of art in its quest for the absolute and the elementary. From her ﬁrst imaginary or real expeditions to the Frozen North to the exploration of systems for representing the world – from the science of pop songs to sitcoms – Nathalie Talec is interested in halfway states, intermediate positions and zones of uncertainty. Thus, what she is really probing in her combinations and agglomerations from various sources (the histories of science and art, personal anecdotes, etc.) is the ﬁctionalisation of the real. Ever since her ﬁrst works made in 1979, the artist has been the central ﬁgure in this experiment with or experience of the world. For Nathalie Talec the manifestations, narratives and mythologies of cold, but also its contrary, and steam and condensation, too, constitute tools for situating herself in the world, an instrument of analysis and subjective location, of metaphysical reﬂection. Paradoxically, cold is a state with rich imaginary and symbolic connotations, yet at the same time it creates a sense of distance: it freezes and immobilises. The artist’s constant use of the feigned, the factitious, of artiﬁce, simulacra and lip-synching, all partake of this twofold movement of immersion and withdrawal. This ﬁrst retrospective charts an artistic adventure that began thirty years ago. Neither chronological nor exhaustive, it brings together some thirty works (drawings, videos, photographs, sculptures, performances, projects) like so many ﬁctional markers, initiators of narrative and decoys. It units vintage pieces, recreations and new works in a novel ensemble, a conception that is itself literally an artwork. Older vintage works, recreations, new productions are all brought together in a new-fangled ensemble, artistic design which is literally the artwork, borrowing some cinematographic practices and industrial imagery. Nathalie Talec, L’abécédaire by Nathalie Talec, from the Petit Journal for the exhibit Solo intégral, my way, Frac Franche-Comté, 2006. Knud Rasmussen, Du Groenland au Pacifique: two intimate years living with the tribes of unknown Eskimos. 1929. At the entrance of this exhibition room, Nathalie Talec has copied this extract from the explorer Knud Rasmussen’s notebook. Besides this expedition in Green in 1987, the expeditions of Nathalie Talec are just fiction where the faces imitate those of famous polar explores such as Paul-Emile Victor or Knud Rasmussen. In an interview with Claire Le Restif, she explains her idea of polar exploration being a metaphor of artistic experience. Nathalie Talec, Autoportrait avec détecteur d’aurores boréales, 1986. “Portraits stratégiques” series. Collection Mac/val, Vitry-sur-Seine. (...) If science interests Nathalie Talec, it’s the language, an investigation system of reality, an amount of knowledge to reinvest using the imagination and way of talking about the world. To test these codes and approach, the artist embraces the gestures of the laboratory assistant and mimics the position of the lecturer. She goes as far as putting her signature to an innovative measuring system. Nathalie Talec, interview with Claire Le Restif, “La première fois que j’ai vu la neige, c’était au Paramount”, catalogue from the exhibition Nathalie Talec, Mac/val, 2008, p.181. 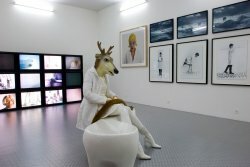 “The deer has become my icon and today wonders about the question of knowledge, art and language throughout works as diverse as performances, photographs, drawings or even songs”. Nathalie Talec. Quote, extract from the folder “Les bois de l’incertitude”. 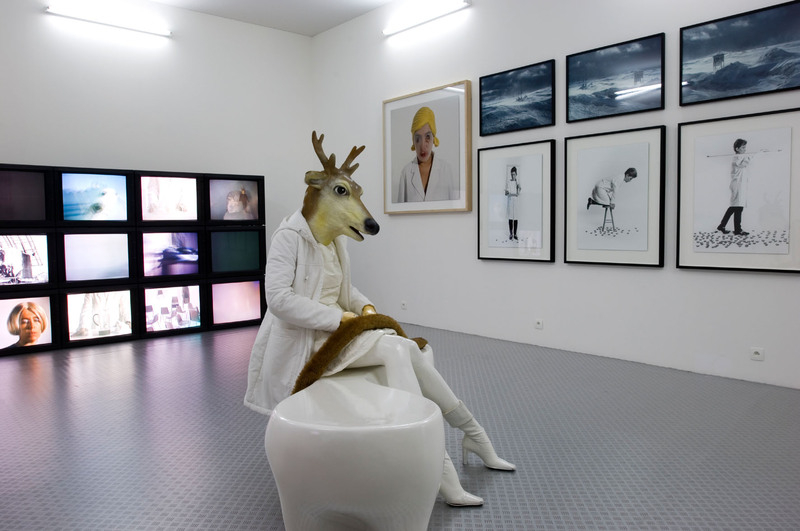 Since the year 2000, Nathalie Talec uses the ambiguity of this cross breed, the deer, to multiply references and act in different contexts such as tales and art history, the media world and archaic mythology. Song by Nathalie Talec, Haute fidélité (extract). Performance at the Louvre Museum, January 2006. Nathalie Talec goes on stage and plays the part. Understanding her personas and stance as singer is also like considering “posture art” as some sort of art expression. She’s a worthy heiress of the “Fluxus attitude” contributing to the appearance of a pop-music media figure. As for her sources of inspiration, she draws on scientific literature, mythology but also from television and media hero invented for an audience searching for sensations like in sitcoms and popular variety shows to delve into both the intimate and romantic.